Recent reports featuring The National Wooden Pallet & Container Association have instigated praise for the wooden pallet and container manufacturing industry for the impact they have had on US employment. The study named ‘Economic Analysis of the U.S Wooden pallet and Container Industry’ is an incredibly positive piece of research – highlighting the far reaching effects that the industry has had on the local and wider community and economic health. The report indicates that the wooden pallet and manufacturing industry is now made up of around 173,000 jobs across the US. Not only does this help with overall unemployment rates, however they believe it also has an economic impact of more than $31 billion in economic activity. Key components of this industry form part of a much wider and more complex value chain. With so many industries relying heavily on the wooden pallet for their logistics, this industry is one which has continued to expand year on year. 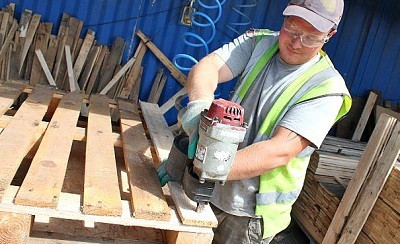 With other recent reports recognising the continued dominance of the wooden pallet, it does not look as though this promising outlook is likely to change any time soon. This is great news for local communities who get much needed support and stability from the related growth and continuation of local jobs. The statistics behind this report provide the industry and related associations with additional credibility when it comes to lobbying. The work carried out has allowed The National Wooden Pallet & Container Association access to critical data that they would not have otherwise been able to access. It is suspected that this level of insight has not only given additional certainties for the future, but that it will also have the potential to inform policies that generate employment opportunities and provide support to local communities.